And I said what about Breakfast at Tiffany's?" he whispered in her ear. That was Chris and Theresa's favorite song. They were dancing at a garden in the summer while the sun set, sipping champagne. As the slow romantic song, not their favorite one of course, came to an end he took her hand and guided her back to the table. The special occasion was Theresa’s parent’s 25th wedding anniversary. They were seated at Table 9 and love was definitely in the air. Chris knew this was the moment. The dance had concluded, the celebration was coming to an end and the crowd was dying down. He looked deep into Theresa’s eyes and smiled, nervous but so very excited. He stealthily reached into his jacket pocket and pulled out the ring. “No turning back” he thought to himself, this is the moment they had both been waiting for. With love and smiles he got down on one knee and opened the box. Theresa started to tear up but smiled from ear to ear. He asked those four special words, “Will you marry me?” She joyously said yes and they joined in a warm embrace and other guests clapped and cheered. The scary part was over now was the fun part! It was weeks later and the wedding planning commenced. Her favorite color was Tiffany Blue and that is why he always would sing her the song. He knew her well, she was his best friend and he couldn’t wait to spend the rest of his life with her. 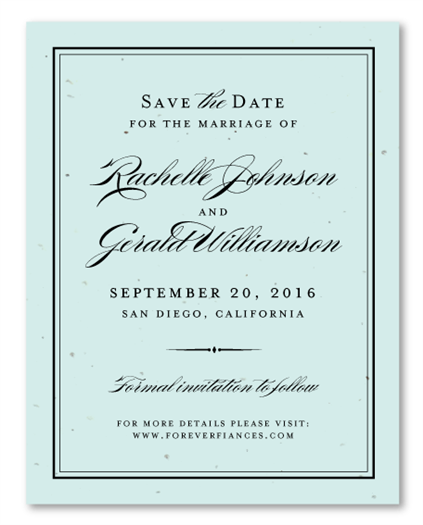 They had been informed by their newly wed friends that ForeverFiances has many options and can even print on Tiffany Blue seeded paper. They browsed the invitations together and wanted something simple and elegant. With so many options they thought it would take ages to agree on something they both knew their friends and family would be excited to open and put on their fridge as the countdown began. What was even better was the guests would then be able to plant the wedding invitations and they would soon blossom into beautiful wildflowers, displaying a constant reminder of Chris and Theresa’s grand day. It was not a very tough decision after all and they chose the classic and chic Tiffany Elegance invite. 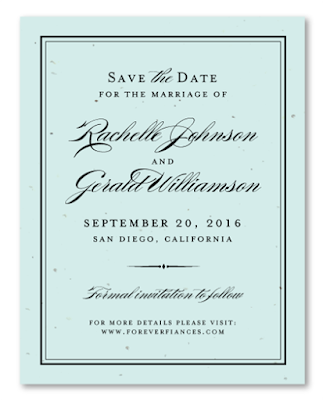 ForeverFiances has many options to completely customize your wedding invitations and all the stationery to match! 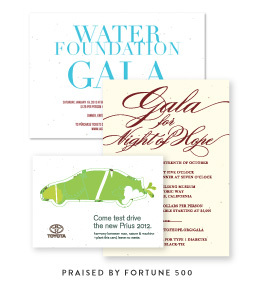 We offer place cards, thank you cards, RSVP cards, wedding programs and much more. The plantable paper comes in various colors including Tiffany Blue, White, Cream de Lait, Haystack and more! Shop Tiffany Blue wedding cards today! Tom and Jessica were sitting on a bench in the park under an apple tree trying to plan their perfect day. Trying to recreate the magic of the very first day they met, they had hopes and dreams of a wedding day that all their friends and family would never forget, not just the happy couple themselves. They had met in a park while they were both jogging after work, enjoying the cool breeze and the relaxing sunset that filled the air with marvelous colors. They had both stopped at the water fountain to refresh themselves at the same time. Tom, being the gentleman that he is, graciously offered Jessica the first drink. They smiled at each other, both blushing and a little shy, then Tom introduced himself. That was all it took and they made future plans to go jogging gorgeous sunsets together every Friday evening. Now back in that same very park, they were planning their wedding and although they were out of college, they were still on a budget due to car payments, student loans and other common expenses. 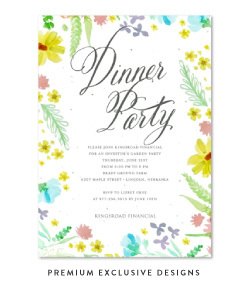 One of their friends had recently got married and used ForeverFiances' wedding invitation was on plantable paper, meaning the paper was actually embedded with wildflower seeds and could be planted and eventually grown into beautiful wildflowers or garden herbs. They both thought it was such a fantastic and unique invitation but weren’t sure if they would be able to afford it. Jessica asked her friend where they had received these whimsical invites and directed her to ForeverFiances and the affordable wedding invitation collection.